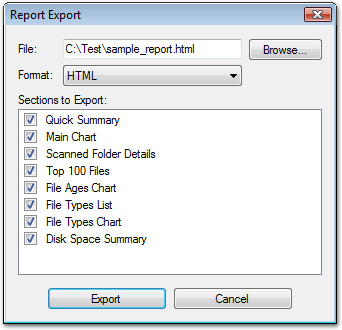 This dialog box allows you to generate a report of the current scan, choose which sections you would like to be included in it as well as the type of the report, and export it to the desired location. File: Specifies the main file to which the resulting report will be written. Note that there may be other files accompanying it, such as charts and diagrams, which will be written to separate files. Hitting the "Browse" button will open a standard Windows file chooser dialog. Format: This field determines what format the report is to be exported in. Supported formats include HTML, XML, CSV (for import in Excel) as well as plain text files. Sections to Export: This list allows you to choose which sections you would like to be included in the report. Most of them correspond to one of the standard SizeMeNow views or charts.